Longing to remove the unnecessary in your life? 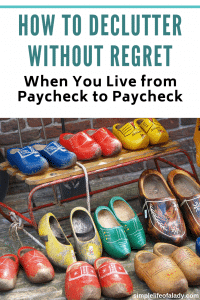 How do you do that if you live from paycheck to paycheck? 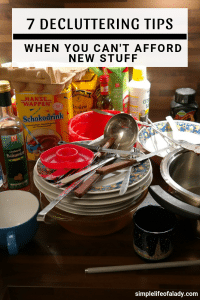 When you live on a low income, decluttering can be hard because if you happen to throw something that you thought you didn’t need anymore, then find out later that you still needed it, you will have to spend again. You could have avoided spending if you did not throw that stuff yet. 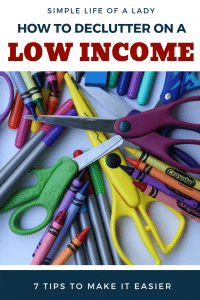 Moreover, if you grew up in poverty, at times without food and a home, it’s even more understandable if you think that everything you acquire is an asset, and something you just can’t let go – at least not as easy as a decluttering expert would advise. Now with all these crippling you, how do you declutter? Is it even possible to really achieve a clutter-free home? Yes, it’s possible. And yes you can! But you have to be patient. And you need to approach decluttering in a much different way because you can’t just throw anything that “doesn’t spark joy”. Here are seven ways to make decluttering easier for you. 1. Know the difference between what you want and what you actually need. It is so easy to get caught up in what we want, thinking that it is a legitimate need. But the fact is, we do not really need that much to live a happy life. For example, how many pair of shoes do you have right now? How many of that do you really need? Are there pairs that you can you do without? I currently live on just three pairs, a fact that I am really proud of. I have 2 pairs of doll shoes and one pair of rubber shoes. I work from home so I don’t really need a shoe for office purposes. I’m also completely fine going out from time to time in just slippers. I wear the rubber shoes when we jog or go on a nature trip. The doll shoes – I just bought that for my wedding and that occasion is now over, which means I can already toss them if I want, because I don’t need them anymore. I’ll probably sell them. Now I’m not asking you to be like me and just live on two pairs of slippers and a pair of rubber shoes. Perhaps you go out everyday for work. Or maybe you travel a lot. Maybe you’re in a place where it can get muddy every once in a while. What you need depends on the current situation that you’re in – your job, your place, the activities and occasions that you are often involved with. Which is why you should listen to the second tip. This is probably the biggest mistake we make when decluttering. I know because I also committed this mistake when I thought that I should be able to declutter and organize my room in just a day or a half, like my Mom. Turns out that I can do that but I need a few minutes everyday, for a couple of days. In the same way, don’t compare yourself with others in terms of the items that you need, how you declutter, and how long it takes for your home to be clutter-free. You may find some similarities with others, like the way you fold your clothes, and that’s great! But when things are already different, like how many clothes you need, it’s very much okay to be completely different. So don’t try to be uber-minimalist like me when it comes to your shoes. Evaluate what you really need given your current situation. Declutter from there. And that’s where the next step comes in. 3. It’s okay to have duplicates. You may have heard the very familiar advice – get rid of all duplicates. This does not also mean that you just keep as many duplicates as you can. Well I used to have a container full of pens, used and new. Then I observed that I only needed five pens on my table. I still keep more today in my drawer, just in case someone borrows it and it never returns; or just in case I lost it somewhere around the house which can happen very often. But it definitely is less than 50 pens now. So yes, it’s okay to keep duplicates. Just do it in moderation. The next step tells you how. 4. Evaluate how easy (or difficult) it is to replace an item. How many of your stuff are you keeping because you might need it someday, or just in case something breaks down? You probably have a lot of that. Again it’s okay to keep duplicates just in case something needs replacing sooner. It’s okay to save stuff just in case you need it someday. Now this is where you may tend to keep a lot of your stuff. So again, do it in moderation. That becomes easier if you know how easy or difficult it is to replace an item. You can let go of the things that are easy to replace and use your storage space for the items that are difficult to replace. How to determine that is the wisdom that you need. And here are some guide questions to help you with that. How much does it cost? Can I afford it? Do you have a good thrift store near your home? Can I get this item for free when I need it again? Perhaps from Freecycle or Buy Nothing Groups on Facebook? Can I just borrow something like this from a friend when I need it? Can I live comfortably without it? If you can easily replace an item for very little money and time, it is safe to get rid of it now. Now what if you’re not sure if you really need it? That’s where the next step comes in. 5. Have a box for things that you are not sure you’ll need. Label it with the date today – when you keep your stuff in there. When you need something from that box, get it. That’s the confirmation that you still need that. After a year, those items that still remain in the box, you can get rid of them already. Now you are sure that you won’t need them anymore. If you think six months is enough for you to determine whether you still need an item or not, then use six months. I just recommend a one-year cycle so that you can go through all the seasons. This way, if there are seasonal items in that box, you will be sure that you really don’t need them anymore. 6. Don’t let things dictate your emotions. I have long learned that happiness is a choice. While we need things to be happy, these things are but the basic needs that we can’t do without – food, water, clothing, shelter, transportation, and the stuff that we must acquire to support these needs, like pots and pans for cooking. But these stuff are just things – temporary and prone to loss and damage. It can disappear anytime. So it is best to not be too attached to your possessions, even if it is a gift from the most important person in your life. This is also one reason why I don’t really buy the joy-sparking question, and why you may not too. If you have been reading about how to declutter for some time, you may have come across the idea that to declutter, you should ask yourself whether your things spark joy. If they don’t, get rid of them. For some things, maybe this can be good. Like on those items that you really don’t need and can easily be replaced. But for most of your things, you’ll find that you appreciate it more when you know that they are useful. They don’t necessarily have to spark joy. They just have to be useful, that’s all. It’s okay to take decluttering slowly. It’s okay even if it takes you months or a year to completely declutter your home. There is no one standard on how long you should declutter. In fact, most of the time, it’s not a one time activity, but an ongoing project. 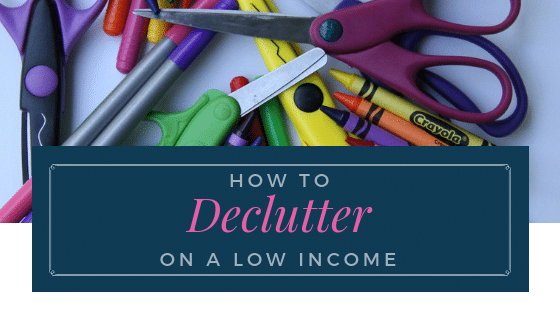 If you’ve read a lot of decluttering posts and minimalism guides, you may have noticed that after reading them, you want to throw away everything you own. That pressure can lead you to get rid of things immediately, which increases your chance of regretting it later. By taking it slowly, you will avoid being pressured to throw things right away. So the next time you see a post on Pinterest that says “100 Things You Can Throw Right Now”, simply take it as a guide, and not an absolute rule. Happiness is not dependent on the stuff that you own. In fact, when your basic needs are already being met, more stuff won’t have much impact in your happiness anymore. It becomes even better when you have less. Less stuff means you have less to organize and clean. You have more time and more energy for the more important things in your life. When you have what you need and the people you love with you, what more can you possibly ask for? Focus on the necessary things in your life. When you do, you won’t be afraid to lose what’s unnecesary. Found this article useful? Take a second and Pin it! Sharing is caring!